Topology built based on Wink et al. (2004) and relationships are consistent with those found in Wink et al. (2009). Multiple species remain to be analyzed. Christidis, L. and Boles, W.E. 2008. Systematics and Taxonomy of Australian Birds. CISRO Publishing, Collingwood, VIC, Australia. Gill, F. and D. Donsker (Eds). 2011. IOC World Bird Names (version 2.9). Available at http://www.worldbirdnames.org. Accessed 25 July 2011. Rasmussen, P.C. and Anderton, J.C. 2005. Birds of South Asia: the Ripley Guide. Barcelona, Spain: Lynx Edicions. Wink, M., H. Sauer-Gurth, and M. Fuchs. 2004. 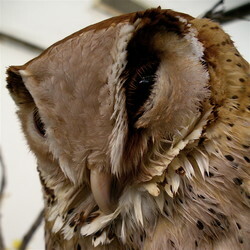 Phylogenetic relationships in owls based on nucleotide sequences of mitochondrial and nuclear marker genes. Raptors Worldwide: 517-526. Wink, M., A. El-Sayed, H. Sauer-Gurth, and J. Gonzalez. 2009. 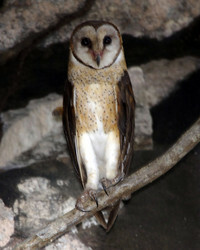 Molecular phylogeny of owls (Strigiformes) inferred from DNA sequences of the mintochondrial Cytochrome b and the nuclear RAG-1 gene. Ardea 97(4): 581-591. Page: Tree of Life Tytonidae. 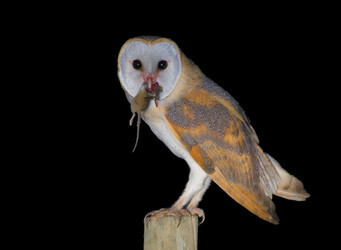 Barn Owls, Masked Owls, and relatives. Authored by Julia Gulka and David P. Mindell. The TEXT of this page is licensed under the Creative Commons Attribution-NonCommercial License - Version 3.0. Note that images and other media featured on this page are each governed by their own license, and they may or may not be available for reuse. Click on an image or a media link to access the media data window, which provides the relevant licensing information. For the general terms and conditions of ToL material reuse and redistribution, please see the Tree of Life Copyright Policies.